What is fixed income and why is it important for all investors? Investors know they need to be diversified, and most are familiar with shares, funds, and property. You may think you’re less familiar with fixed income, but if you have money in Term Deposits (TDs), you probably already know a lot about it and its role. Investing in bonds is a large part of the fixed income world. Recent developments mean both individual government and corporate bond returns are now available to investors on ASX. So, what is fixed income? When we talk about fixed income, we mean any investment where an investor lends money (the principal) to a borrower or issuer. The issuer then makes payments (interest or coupons) to the investor of either a fixed amount, or an amount linked to a moving benchmark. Income payments occur on a fixed schedule of dates. The issuer pays back the principal on a fixed date, which is the end, or ‘maturity’ of the investment. This definition captures both TDs and bonds. If an investment has any right for the borrower to defer payment, or otherwise avoid paying either coupons or make the final repayment of principal, then you should question whether it is fixed income. Fixed income is very different to shares. Income and capital re-payments are 100% mandatory and fixed income always matures on an unmovable date. With fixed income you have certainty you’ll get your capital back assuming the borrower doesn’t get into financial trouble and default on the loan. Bond investors are OWED money by companies. Investors in bonds are looking for return OF their capital. Share investors are looking for a return ON their capital. Think of this as loaning a friend or family member some money – being paid back on time is critical to the deal. Bonds and TDs¹ are forms of a loan from you to the bond issuer or bank. They have steady performance features that place them in the defensive part of your portfolio. Usually they don’t move in the same direction as shares, which means they provide true diversification, and generally, they have far less price movement (volatility). Most advisers would agree – whatever your stage of life, diversified portfolios should include an allocation to fixed income. A rule of thumb coined by John Bogle the founder of global asset manager Vanguard is “your bond allocation should roughly equal your age”. Whilst clearly not meant to be scientific, it demonstrates the increasing need for fixed income as we move through life. 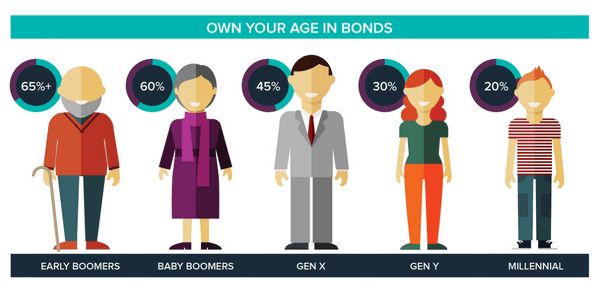 Read our article “Own your age in bonds” to discover more on this concept. Fixed income assets are defensive. They can play an anchoring role in a diversified investment portfolio, because they are not correlated with shares. Fixed income is generally lower risk than shares, with regular interest that provides a steady and predictable source of income. Bonds and TDs offer capital stability because they do not fluctuate as much as shares and hybrids. Bonds enable investors to lock in their return at the time of investing, assuming that they are held to maturity. See how it works with our Cash Flow Tool. Now it’s time to find out more about corporate bonds. ¹Term Deposits may enjoy the benefit of protection under the Financial Claims Scheme.